Practice poi are bean bag like poi which are stuffed with tiny plastic pellets instead of beans so they can get wet without mold forming inside the poi head. 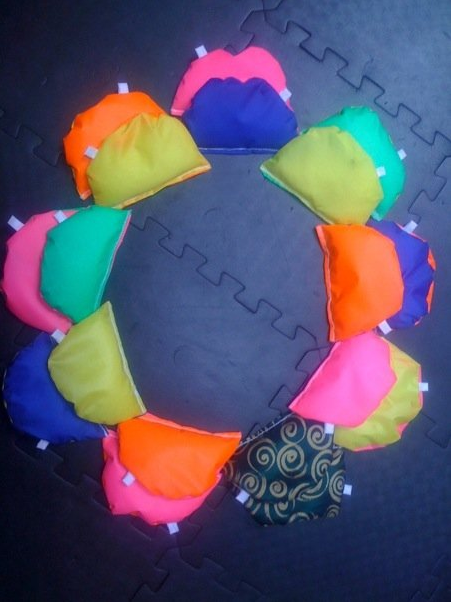 These bean bag style poi are excellent for beginners because the impact is spread over a large surface area which subsequently leads to less intense impact on the body than tennis ball poi and other rounded poi. The distribution of weight between the bean bag head of the poi and the handle also allows for smooth swinging. 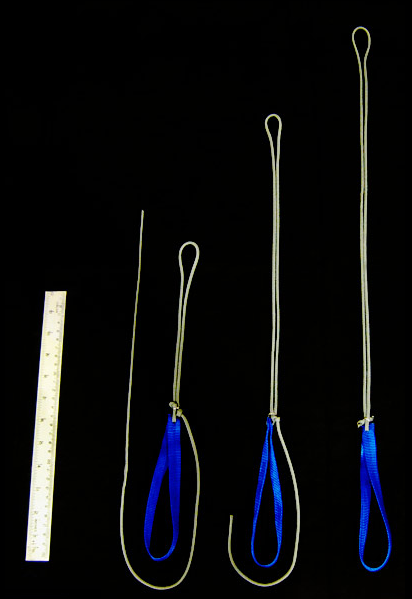 These poi are somewhat lighter in weight than fire poi, allowing for hours of practice without much muscle strain. They are responsive when stalling and generally just feel great to use. 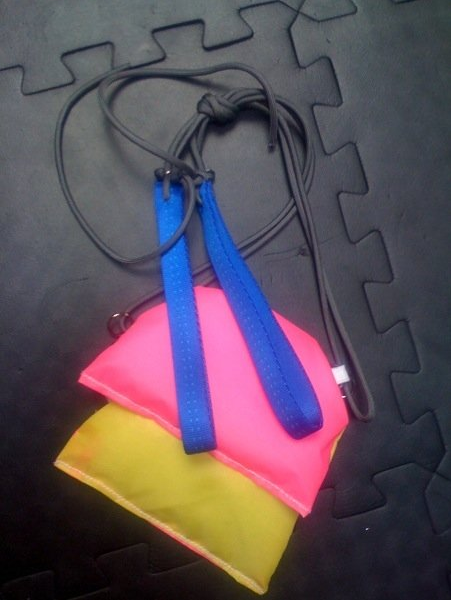 Our practice poi are made with high quality swivels connecting the bean-bag poi head and leash. The use of swivels creates less drag when the tool is spinning and therefore allows for more ease of movement. Rather than using some rough fabric for the handle, we opted for the high quality leashes made by FlowToys which are adjustable and can be used for hyperloops. These leashes are attached to soft, durable handles which feel good on the hands. In addition, our poi heads are reinforced a dozen times with double stitching and added muslin fabric to reinforce the seam where the leash connects to the poi head. Color selection will vary according to present stock, though we're currently using bright pink, yellow, orange, green and blue as well as stocking the green nylon with gold swirls pictured above. When selecting, please give us your top 4 colors and we'll do our best to get you poi in the top two colors of your choice. Items generally shipped within 2 business days of purchase. Please go to our current web site for practice poi purchase.
" In the middle of a huge risk in my life and coming to learn poi is a really great way for me to play and develop self-esteem artistically. I felt really good about the breakthrough I had with a few moves the other day [at flow rEvolution]."